* TranScribe is continually enhanced and upgraded online software which may be used for seven days without charge and is thereafter annually licenced for just £13. 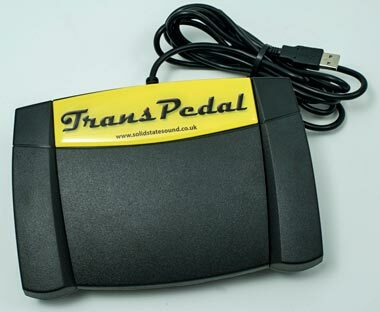 Our latest TransPedal-2015 is a simple and straightforward transcription foot-pedal device that plugs into one of your your computer's USB sockets and enables digital audio files to be transcribed just like in the bad old days of tape and cassette. It even comes with the dedicated software you need to use it. 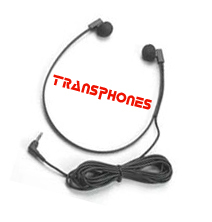 Our TransPhones are comfortable, high quality, under-chin headphones you can plug into your PC for private listening to the audio you need to transcribe. Our TransKit-2015 is a set of both of these items purchased together (you may also purchase them separately - see below). Before solid state digital recording came along, people who needed to transcribe the contents of their recordings onto paper used to plug a footswitch into the recorder, put on their headphones and type up their recordings while foot-stopping and foot-starting the clunky cassette transport (stretching the tape and hating the hiss). Then along came solid state digital recording. No tape or hiss, but how to stop and start the recordings while you transcribe them to paper? Use a mouse or keyboard? You must be joking. Thank goodness for the Solid State Sound TransPedal-2015 & TransPhones. Now court reporters, oral history recordists, security companies, government departments and many others can easily transcribe their new-fangled solid state sound recordings just like they used to. The TransPedal delivers even more control too. Basic Stop/Start (foot up/down) control is provided as well as Rewind (in case you missed something) and and Fast Forward (in case you want to miss something out). And with the included* TranScribe transcription software program you can even slow recordings down for even easier and less pressured transcription. 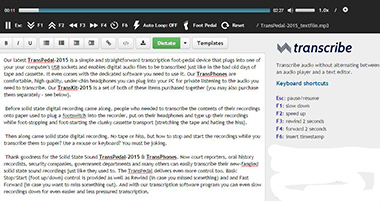 TransPedal-2015 works with TranScribe transcription software either on a Windows PC or a Mac running the Chrome browser. It's really easy and straightforward to setup and use. And it even saves every single character you type, as soon as you've typed it, so you won't lose a thing. Click here for further details. 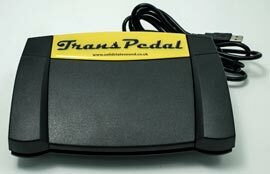 Just physically connect your TransPedal-2015 into any free USB socket on your computer, plug your TransPhones in to your headphone jack and you're away. Your computer's operating system will recognise the TransPedal-2015 straight away - you don't need to do anything. • Open an audio file and off you go! Once you've copied your audio files across to your computer, just select the one you want in TranScribe, then let your foot do 'The Stop/Start/Rewind/Fast-Forward Shuffle'. To your heart's content. Life will become sweeter and you will want to sing with joy (but you won't be able to until you've transcribed the whole file or there'll questions from the boss).